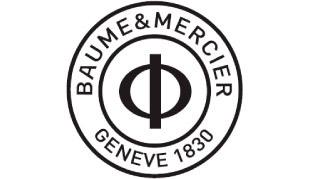 BONNEVILLE – 14 AUGUST 2017: Baume & Mercier, major Swiss luxury watchmaking company part of the Richemont Group and Indian Motorcycle, America’s First Motorcycle Company, today announced an exclusive partnership. The historic Bonneville Salt Flats served as the venue to unveil this unique brand alliance, as Indian Motorcycle and Baume & Mercier honoured the historic achievements of motorcycle trailblazer and famed land-speed record holder, Burt Munro. It has been 50 years since Munro took his Indian Scout Streamliner to push the limits of speed at the Salt Flats, entering history to become “The World’s Fastest Indian”. To celebrate the 50th anniversary of Munro’s iconic land speed record, Lee Munro, Burt Munro’s great nephew, recreated the historic run at Bonneville on Sunday 13 August. For more information and content related to Indian’s unique celebration of the 50th Anniversary of Munro’s iconic land speed record, visit www.indianmotorcycle.com/en-us/burt-munro. In this unique collaboration, the two brands will capture the iconic spirit and translate it into a series of limited edition watches paying tribute to Indian Motorcycle’s iconic history, which will be revealed later this year. Each design is enriched with exceptional details and will please watch enthusiasts and moto aficionados seeking uniqueness. 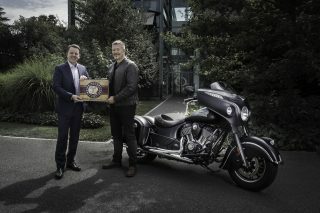 Picture caption: Alain Zimmermann CEO of Baume & Mercier and Grant Bester, Vice President, Indian Motorcycle EMEA, celebrate their partnership in front of a Chieftain Dark Horse outside Baume & Mercier’s HQ in Geneva. Baume & Mercier has been watchmaking for 187 years and has always been a generous Maison expressing excellence in all its creations. It maintains a simple, consistent motto devised by its founders: “Accept only perfection, only manufacture watches of the highest quality”. Current collections include the Clifton and Clifton Club that feature the sporty-chic Capeland, the timeless Classima and My Classima lines, as well as the rectangular shaped Hampton. Dedicated lines for women are offered through Linea, a sparkling and daring offering. The newest line, called Promesse, offers a refined blend of elegance and preciousness. Time captured with a Baume & Mercier watch is marked by rare, exceptional moments that punctuate a lifetime. The Maison celebrates these as a vibrant witness of these unforgettable moments filled with a wealth of emotion.